The Sauer Family came, as German-Russian immigrants, to the United States in 1899. Johannes Sauer and Christina Sterkel were married January 26, 1899 and traveled to the US on their honeymoon, a 28-day journey to a new homeland. They left Norka, Russia and arrived in Galveston, Texas. They were sponsored by a family member who lived in Denver, where they settled and began a family. 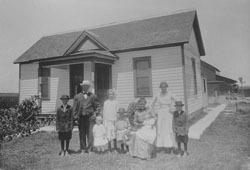 Johannes and Christina had seven children, Katherine, Pauline, John, Harry, Leona, Dan and Randolph. Johannes worked at the Denver Smelter for several years, saving money, earning between $1.50 and $2.50 per day, to be able to buy a farm. In 1909 he purchased a 40-acre farm near Johnstown, Colorado, where he began to fulfill his dream of farming and feeding livestock. In 1917, at the age of 43, Johannes was helping a neighbor, when he lifted a hog and tore his aorta, dying 3 days later. His children at that time ranged in age from 2 to 16. Christina then raised her children as a widow. John Sauer, Sr., who was 12 and the oldest son, dropped out of school to help provide for the family. 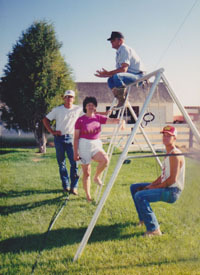 Over several years, the whole family worked together and managed to purchase additional farm ground in the Johnstown area. As time passed, Christina’s children established their own families and farm properties. John Sauer, Sr. married Rachel Spade in 1939 and began a family. He and Rachel had four children. John Sauer, Sr. bought the current headquarters of the Sauer Family Beef operation from his mother in 1953, where he added a dairy cow herd to his farming and cattle feeding operation. John Sauer, Sr. and his son, Henry, worked together until John’s passing in 1987. Henry Sauer was born in 1945 and met his wife, Cindy (a city girl from Lakewood, Colorado), when they both attended Colorado State University in Fort Collins, Colorado. He received his degree in Animal Production and spent his life pursuing his passion of farming, dairying and feeding cattle. Henry was able to add farm acreage to what his grandfather and father had acquired, to allow for succeeding generations to have the opportunity to continue the family tradition. Henry and Cindy had 3 children. Henry passed away in 2005, having equipped sons Abe and Alex from a young age with the knowledge of how to sustain the operation. Abe was born in 1970, graduated from Colorado State University with a degree in Animal Science in 1993. While at CSU, Abe ran Track and Cross-Country. He is married to Christine, and they have three children. Alex was born in 1975, graduated from Colorado State University with a degree in Farm and Ranch Management in 1997. While at CSU, Alex met his wife Tracy, and they have four children.